"G222" redirects here. For the highway in China, see China National Highway 222. The Aeritalia G.222 (formerly Fiat Aviazione, later Alenia Aeronautica) is a medium-sized STOL military transport aircraft. It was developed to meet a NATO specification, but Italy was initially the only NATO member to adopt the type. The United States purchased a small number of G.222s, designating them the C-27A Spartan. A modernised variant, the Alenia C-27J Spartan, has been developed. While it retains many aspects of the original aircraft, the C-27J adopts the same engines and many of the systems used on the larger Lockheed Martin C-130J Super Hercules. In 1962, NATO issued a specification for a V/STOL transport aircraft (NATO Basic Military Requirement 4), capable of supporting dispersed V/STOL fighters. Fiat's design team, led by Giuseppe Gabrielli, produced a design to meet this requirement, designated G.222; it was to be powered by two Rolls-Royce Dart turboprop engines and with six to eight Rolls-Royce RB162 lift engines to give VTOL capability. According to Aeritalia, the G.222 designation is derived from the first letter of the aircraft's chief designer; the first '2' referring to the twin-engine arrangement, and the final '22' referring to the revised NATO Basic Military Requirement 22 to which it had been submitted. None of the submissions resulted in a production contract; however the Italian Air Force (AMI), who was at the time seeking a replacement for the Fairchild C-119 Flying Boxcar, felt that the Fiat Aviazione proposal had merit, and placed an order for two prototypes and a ground-test airframe in 1968. The G.222 was substantially redeveloped from the NATO submission, the V/STOL lift engines having been omitted completely and the conventional Dart engines replaced by a pair of General Electric T64s; the twin-boom tail featured on the V/STOL concept was also eliminated and replaced by a more conventional single tail configuration; subsequently the new aircraft had no V/STOL capability but retained considerable short take-off/landing (STOL) performance. Fiat G.222TCM development aircraft exhibited at the 1977 Paris Air Show. On 18 July 1970, the first prototype performed the aircraft's maiden flight with test pilot Vittorio Sanseverino at the controls. By late April 1971, the prototype had reportedly conducted a total of 22 flights and accumulated 50 hours of flight time, during which its performance was claimed to have been highly close to predictions. In December 1971, the Italian Air Force, who had placed a provisional order for the developing type, formally began evaluating the G.222 and the performance of the two prototypes then in service. Following a successful testing period, the AMI contract for 44 aircraft was issued to Aeritalia (of which Fiat Aviazione had since become a part). In December 1975, the first production aircraft conducted its first flight. In April 1978, this same aircraft formally entered service with the AMI. 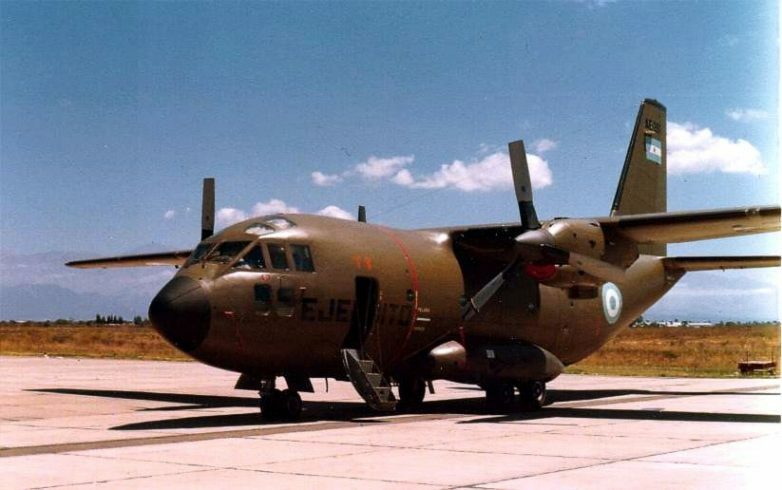 Following on from its introduction by the AMI, the G.222 was procured as a tactical transport aircraft by various international customers, including Argentina, Nigeria, Somalia, Venezuela and Thailand. In December 1978, Aeritalia elected to transfer final assembly of the G.222 from Turin to Naples, at which point a total of 44 firm orders had been obtained for the type and one aircraft per month was being manufactured. Manufacturing of the G.222 was broken down into various companies; construction of the fuselage was performed at Naples, the center-section of the wing was produced by Piaggio, the wing panels were made by Macchi, the tail surfaces were built by SIAI-Marchetti, the engine nacelles by IAM, and the T64 engines were license-manufactured by Alfa Romeo and Fiat. In 1977, Libya sought the purchase of 20 G.222s; this was vetoed by the U.S. Government, who had imposed an embargo on military arms and equipment to Libya, which included the G.222's T64 engines. To get around this restriction, Aeritalia developed a version of the G.222 powered by the Rolls-Royce Tyne engine and other US supplied equipment was replaced by European equivalents; the more powerful Tyne engine also reportedly gave this variant superior "hot and high" performance. The provision of alternative powerplants was viewed by Aeritalia as a measure to widen the overall appeal of the G.222; the Tyne engine also reportedly possessed greater growth potential than the T64 engine. In May 1980, the first G.222 equipped with the Tyne engine performed its maiden flight. Libya placed an order for 20 Tyne-powered aircraft instead, with deliveries commencing from 1980. In order to extend the effective operational lifespan of the type, some operators have carried out extensive upgrade programs of the G.222. In the aftermath of Italian humanitarian missions in Bosnia and Somalia, in 1996 the AMI began undertaking a major update program on their G.222 fleet; modifications include cockpit lighting changes for compatibility with Night Vision Goggles to enable night operations, increasing the aircraft's self-defense capabilities, new communications and navigation systems, and the removal of obsolete equipment. In July 2005, the Nigerian Air Force signed a $74.5 million contract with Alenia Aeronautica for the refurbishment of a total of five G.222s, as well as the purchase of a retired AMI G.222. In 1990, the United States Air Force selected the G.222 as the basis of a "Rapid-Response Intra-Theater Airlifter" (RRITA). Operated under the designation C-27A Spartan, ten G.222s were purchased and underwent avionics upgrades by Chrysler Aerospace. These aircraft were stationed at Howard AFB, Panama. The USAF would later dispose of their C-27A fleet, partly due to shifting priorities between the Army and the Air Force and partly because of the impending introduction of a newer variant, the Alenia C-27J Spartan. The G.222 is a twin turboprop-engine tactical military transport aircraft, and is designed to be capable of transporting equipment or troops in combat zones and operating with minimal ground support. Early production aircraft were exclusively fitted with the General Electric T64-GE-P4D turboprop engine, the licence-built Rolls-Royce Tyne was made available as an alternative powerplant for the type from 1980 onwards, while the Allison T56 was another proposed powerplant for the type. Due to features such as double-slotted flaps, stacked brakes, and reversible propellers, the G.222 has excellent short landing capabilities and is able to land in as little as 1,800 feet. It was designed to be integrated with the larger, commonplace Lockheed C-130 Hercules. The G.222's cargo deck can carry up to 9,000 kg (19,840 lb) of cargo, or alternatively up to 53 troops, or 32 paratroopers, or a maximum of 36 stretchers with six attending medics in a medevac capacity. The cargo deck has a large rear ramp, allowing the loading of palletised goods and vehicles, as well as sliding doors on either side of the fuselage, which are capable of being used to deploy paratroopers. Various pallet-based special mission equipment could be readily installed to enhance the aircraft's capabilities for diverse roles such as VIP transport, maritime patrol, aerial firefighting, and calibration functions; this equipment could also be removed quickly in order for aircraft to be returned to conventional transport missions. To easily facilitate the loading of a wide range of cargos, the height of the landing gear can be manually controlled. In part due to the austere maintenance requirements of the G.222 and its capability of operating from short unprepared airstrips in remote regions, it has seen heavy use for performing various humanitarian missions across Africa, East Asia, Europe and Central America. The cockpit provides excellent external visibility for pilots, most of the key controls are centrally-placed between the two pilots, enabling the aircraft to be flown by a single pilot under certain circumstances. The standard G.222 is equipped with various avionics, such as a nose-mounted Doppler radar, navigational computers, radio systems, and a Rockwell Collins-built autopilot. Electronic receiver equipment and up to ten control consoles were installed upon a number of G.222s for performing electronic reconnaissance missions. Some aircraft were fitted with aerial refuelling probes and associated equipment. Some Italian G.222s have been equipped with a self-protection suite, which uses multiple forms of sensors to warn against identified threats, this suite also includes several countermeasures such as chaff and flare dispensers. In 1978, the 98th Group of the 46th Transport Air Wing became the first squadron of the Italian Air Force to receive the G.222. The type was promptly placed into a support capacity, not only to the Italian Air force but also for humanitarian and civil protection. The G.222 has seen considerable service in air relief and military supply operations. From 1979 onwards, Italy, along with other Western nations, provided considerable military aid to Somalia, part of the Italian contribution was four G.222s. In 1982, three Ejército Argentino G.222s were operational during the Falklands War, and may have participated in a logistical capacity. In 1983, a single Italian Air Force G.222 was outfitted for fire suppression duties, alongside an existing C-130 in the same role. On 3 September 1992, an Italian Air Force (Aeronautica Militare Italiana) G.222 was shot down when approaching Sarajevo airfield while conducting a United Nations relief mission. It crashed 18 miles (29 km) from the airfield; a NATO rescue mission was aborted when 2 USMC CH-53 helicopters came under small arms fire. The cause of the crash was determined to be a surface-to-air missile, but it was not clear who shot it. Everyone on board - four Italian crew members and four French passengers - died in the crash. In November 1999, the Italian Air Force placed an initial order for twelve new-build aircraft of an upgraded G.222 derivative, designated as the C-27J, as a replacement for their existing G.222s. In December 2002, Alenia Aermacchi agreed to purchase a total of 39 G.222s that had been previously operated by the Italian Air Forces under a trade-in arrangement as part of the agreed C-27J purchase. In 2005, the Italian Air Force started the phased retirement of their G.222 fleet. Several of the former Italian Air Force G.222s have been refurbished to operational conditions and resold by Alenia Aermacchi, the Nigerian Air Force became the first customer for these refurbished aircraft. In September 2008, Alenia North America was awarded a USAF contract to upgrade and refurbish 18 G.222s, to be transferred to and used by the Afghan Air Force. Ballistic protection, adaptations for serving in the conditions of Afghanistan, and many new avionics systems, including a digital auto-pilot, were installed; two aircraft were also configured for VIP transport duties. On 28 April 2010, the first two of the Afghan Air Force's recently delivered G.222s made their first public display during the Mujahideen Victory Day. In January 2013, the USAF decided not to renew the support contract for the Afghan fleet due to claimed serviceability issues and operational difficulties; Alenia responded, stating that the fleet was exceeding the requirements laid out by the USAF, with 10–12 aircraft available for operations against the requirement for six. The 16 G.222s delivered to Afghanistan were scrapped in the summer of 2014 by the Defense Logistics Agency. After the U.S. spent $486 million to buy 20 C-27As, 16 were sold as scrap to an Afghan construction company for about $32,000; the planes were reportedly scrapped "to minimize impact on drawdown of U.S. forces in Afghanistan." The four remaining aircraft are stored at Ramstein Air Base, Germany, with the U.S. seeking other interested buyers. From January to September 2012, the Afghan C-27A fleet flew only 234 out of 4,500 required hours. (Sistema Aeronautico Antincendio - "aeronautical fire-fighting system") - fire-fighter equipped for dumping water or fire retardant chemicals. Four built for Italian Air Force. Version powered by the Rolls-Royce Tyne for the Libyan Air Force. Sometimes designated G.222L. (Versione Speciale - "special version") ECM version - two built for Italian Air Force. Sometimes designated G.222GE. Ten G.222s purchased for the United States Air Force. Afghan Air Force has received several former Italian Air Force G.222s under a USAF contract. Following upgrades by Alenia, deliveries began in 2009. By December 2012, 16 aircraft had been delivered; the USAF canceled the contract then because of lack of maintenance support from Alenia and scrapped them in summer of 2014. Italian Air Force operated 52 aircraft (42 G.222A/TCM, 4 G.222RM, 5 G.222SAA and 1 G.222VS). Officially retired in September 2005, but at least 1 G.222VS aircraft remains operational. Libyan Air Force operated 20 aircraft. By 2004, these had all reportedly been sold to a private company. Nigerian Air Force received 5 aircraft during 1984–85. Alenia Aeronautica is updating these aircraft. 1 ex-Italian Air Force aircraft ordered in 2008. Somali Air Corps ordered 4 aircraft, 2 aircraft received (former operator). Royal Thai Air Force operated 6 aircraft; retired as of 2010. Tunisian Air Force ordered 5 aircraft never delivered . Dubai had 1 aircraft (former operator). US Department of State has 4 ex-USAF C-27As for transport in support of counter-narcotics activities in South America, primarily Colombia. ^ a b c d e f g Janes 2005, p. 421. ^ Donald (2000). p. 426. ^ Frawley (2002). p. 44. ^ Air International April 1977, pp. 163–164. ^ a b c d e "Alenia Aermacchi G.222: history and features." Alenia Aermacchi, Retrieved: 28 March 2016. ^ a b Air International April 1977, pp. 164, 166. ^ a b c d e f g "Tyne-powered G.222 variants planned." Flight International, 24 October 1981. p. 1262. ^ Evangelisti, Spinoni and Jones 1999, p. A11-2. ^ a b c Gilson 1971, p. 577. ^ Air International April 1977, pp. 167–168. ^ a b Taylor, John W.R., ed. (1988). Jane's all the World's Aircraft 1988–89. London: Jane's Information Group. pp. 143–144. ISBN 0 7106 0867 5. ^ a b c d e Evangelisti, Spinoni and Jones 1999, p. A11-3. ^ "G.222." Flight International, p. 2108. ^ a b c d e "G.222." Flight International, 9 December 1978. p. 2113. ^ Air International April 1979, pp. 170–173. ^ Nkala, Oscar. "Nigerian Air Force takes delivery of 10 locally refurbished aircraft." defenceweb.co.za, 13 September 2013. ^ Donald and Lake 1996, p. 29. ^ McGowen 2012, p. 485. ^ Norton 2002, p. 6. ^ a b Schading 2011, p. 279. ^ Evangelisti, Spinoni and Jones 1999, pp. A11-2. ^ a b c Girolami and Quadro 2006, p. 1–3. ^ Humphrey 2007, p. 66. ^ Braybrook 1982, p. 8. ^ Tran Van Nao 1982, p. 121. ^ Sudetic, Chuck (1992-09-04). "U.N. Relief Plane Reported Downed on Bosnia Mission". New York Times. Retrieved 2009-10-05. ^ Fisk, Robert (1992-09-04). "UN fears aid aircraft was shot down by missile". London: The Independent. Retrieved 2009-10-05. ^ "The Italian Air Force is to buy 12 C-27J Spartan medium tactical transport aircraft to replace its fleet of G.222 transports, becoming the first customer for the Lockheed Martin/Alenia Aerospazio C-27J". Interavia Business & Technology, 1 December 1999. ^ Nativi, Andy. "Italian order launches C-27J." Flight International, 17 November 1999. ^ a b "G222 details surface." Flight International, 3 December 2002. ^ a b "Roll-out of the first G.222 aircraft, refurbished and modernized with systems and avionics, at Alenia Aeronautica's Capodichino plant". Defense & Aerospace Week, 22 July 2009. ^ "Italy retires first G222s." Flight International, 20 September 2005. ^ Kington, Tom. "First Refurbished G.222 Ready for Afghan Air Force"[permanent dead link]. DefenseNews.com. Army Times Publishing Company, 6 July 2009. Retrieved: 6 July 2009. ^ Sobie, Brendan. "USAF may buy new self-protection system for Afghan-bound G222s." Flight International, 6 October 2008. ^ Hoyle, Craig. "PICTURES: Afghan G222s make public debut." Flight International, 29 April 2010. ^ a b Osborne, Anthony and Amy Butler. "U.S. Air Force Halts Troubled Afghan Air Force Transport Deal." Aviation Week, 4 January 2013. ^ a b Sopko, John F. Letter to Charles T. Hagel, Secretary of Defense Archived 18 October 2014 at the Wayback Machine, 3 October 2014. Retrieved: 10 October 2014. ^ DLA junks multimillion planes for Afghan Air Force, sells scrap for 6 cents a pound - Militarytimes.com, 9 October 2014. ^ "AirForces Monthly: The world's number one military aviation magazine". 2010-12-12. Archived from the original on 2010-12-12. Retrieved 2018-03-22. ^ "World Air Forces 2016". flightglobal.com. December 2015. Retrieved 2015-12-10. ^ Feldman 2004, p. 206. ^ Taylor, John W.R.; Munson, Kenneth, eds. (1985). Jane's all the World's Aircraft 1985–86 (76th ed.). London: Jane's Pub. pp. 138–140. ISBN 9780710608215. "Two Twenty Two - Aeritalia's Airlifter". Air International. April 1977, Vol 12 No. 4. pp. 163–170, 202. "An Italian Mini-Hercules:The Versatile Two-Twenty-Two". Air International, April 1979, Vol 16 No. 4. pp. 170–173, 197-98. Baybrook, Roy. Battle for the Falklands (3): Air Forces, Osprey Publishing, 1982. ISBN 0-85045-493-X. Donald, David; Jon Lake (2000). The Encyclopedia of World Military Aircraft. NY, NY: Barnes & Noble. p. 426. ISBN 0-7607-2208-0. Donald, David and Lake, Jon. Encyclopedia of World Aircraft. Single Volume Edition. London:Aerospace Publishing, 1996. ISBN 1-874023-95-6. Eden, Paul, ed. "Alenia G222 and C-27, Mini-Hercules". Encyclopedia of Modern Military Aircraft. Amber Books, 2004. ISBN 1-904687-84-9. Endres, Günter and Michael J. Gething. Jane's Aircraft Recognition Guide. HarperCollins UK, 2005. ISBN 0-00-718332-1. Evangelisti, Gianluca., Maurizio Spinoni., and Patrick F. Jones. "Enhancing Tactical Transport Capabilities: Cockpit Evolution from G222 to C-27J". NATO Research and Technology Organisation, April 1999. Feldman, Shai. The Middle East Strategic Balance, 2003–2004. Sussex Academic Press, 2004. ISBN 1-84519-003-3. Frawley, Gerard (2002). The International Directory of Military Aircraft, 2002–2003. Fyshwick, ACT, Australia: Aerospace Publications Pty Ltd. p. 44. ISBN 1-875671-55-2. Gilson, Charles. "Italy's aircraft industry." Flight International, 29 April 1971. pp. 576–582. Girolami, Claudio and Mauro Quadro. C-27J Spartan: Paratroops and Loads Airdrop Qualification. Alenia Aeronautica, October 2006. Humphrey, James Harry. Issues In Contemporary Athletics. Nova Publishers, 2007. ISBN 1-59454-595-2. McGowan, Sam. Anything, Anywhere, Anytime: Tactical Airlift in the Us Army Air Forces and Us Air Force from World War II to Vietnam. AuthorHouse, 2012. ISBN 1-4685-0563-7. Norton, Bill. STOL progenitors: the technology path to a large STOL transport and the C-17A. American Institute of Aeronautics and Astronautics, 2002. ISBN 1-56347-538-3. Schading, Barbara. A Civilian's Guide to the U.S. Military: A Comprehensive Reference to the Customs, Language and Structure of the Armed Forces. Writer's Digest, 2011. ISBN 1-59963-331-0. Taylor, John W.R. Jane's All The World's Aircraft 1988–89. Coulsdon, UK: Jane's Defence Data, 1988. ISBN 0-7106-0867-5. Tran Van Nao. Forest Fire Prevention and Control. Springer, 1982. ISBN 90-247-3050-3. Wikimedia Commons has media related to Alenia G.222.